US site Sea Of Tranquility have done a review of our album. Writer Jon Neudorf gives his honest view and the admirable advice to go listen for yourself. This because he likes the music and musicianship more than the vocals, with the exception of a couple of tracks. For me the strong point of the album is definitely the musicianship of Peter Cox. He is an excellent musician. Ehinger fares better in the melancholic “The Water Bearer”, lush with keyboards and strings and defined by pretty piano and lead vocals. The disc does include three instrumentals with each showcasing the talent Cox possesses both as a musician and as a highly skilled melodicist. On a whole the album still got 3/5 stars. Read the full review here. Thank you Jon! Rock Company is a Dutch record label that was founded in 1987 and has the primary goal of promoting music in every way possible. The label does this by, among other things, releasing music, writing about music and broadcasting music via the internet. Thereby one focuses on progressive rock and related genres. 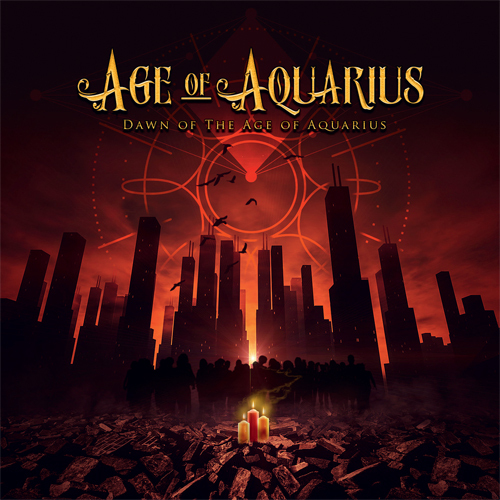 One of the bands – or even better duo – on this label is Age Of Aquarius. They consist of the Dutchman Peter Cox, who plays all the instruments on this album and the British singer Zoe Ehinger, responsible for all lyrics. Multi-instrumentalist and singer Peter Cox is a name unknown to me in the music business. Nevertheless, the man has been making his mark on the genre for quite some time, as evidenced by his involvement with the groups Chinawhite, Forest Field and Earthshine. Dawn Of The Age Of Aquarius is about big changes and the destruction of the old, which will eventually create the new. Uranus, God of heaven and heavens, is the ruler of Aquarius. Destruction and change are the most important parts of this sign, which then brings new thinking, creativity and brings people back to life. Reasonably spicy food that you have to be open to. Musically the album is a lot easier to digest. The ten generally melancholic songs, three of which are instrumental, listen pleasantly and simply. The song structures are generally simple, with the strong guitar playing of Peter Cox having the upper hand. I do not always appreciate the vocals of Zoe Ehinger. In my opinion, her vocals come into its own in more dark-colored songs such as The Water Bearer, Uranian Utopia and the beautiful Mercury Rising. Sometimes she tends to bite off more than she can chew. This is at the expense of purity, such as the more up-tempo Darling Jupiter. The album has a strong final chord with Saturnian Chaos. In addition to the three instrumental numbers, I think the best song. The guitar playing is firmer and more pointed, the rhythm is tighter and the vocals of Zoe Ehinger, who reminds of Grace Jones, are simply very strong. We would like to introduce you to our new project Age Of Aquarius! Uranus, God of the sky and the heavens, is the ruler of Aquarius. Destruction & Change being the key parts of this sign – which then awakens new thinking, creativity and brings people back to life. In Astrology, the energies of Uranus are electric and crammed with change. Uranus is forward-looking. It balks at tradition, and celebrates originality and individuality. And Aquarius empties the vessel of the old, in order to refill it with new fresh waters.